Healthcare policy debates in the United States are dominated by discussions of health insurance coverage and the terms under which consumers enroll in these plans. That’s understandable, because health insurance can be crucial for securing access to lifesaving medical care. But most Americans do not care all that much about their health insurance. Few people are wedded to the health insurance company processing their medical bills. What they care about is ready access to their preferred physicians and high-quality medical care at affordable prices. Health insurance is just a means to that end. Unfortunately, policymakers’ heavy emphasis on expanding insurance enrollment has distorted the marketplace. Expansive third-party insurance has displaced the role of the consumer, weakening incentives for the supply side—that is, physicians and the clinics and hospitals they work in—to find new and innovative ways to give patients the high-quality, low-cost, and consumer-friendly care they want and deserve. The quality of medical care and services in the United States has much to commend it. The country has highly trained physicians and a network of sophisticated clinics and inpatient institutions that is unrivaled. Moreover, the United States is home to a vibrant biological and pharmaceutical product industry. And yet, despite these strengths, there is plenty of reason to worry that the provision of health services to the US population is far from what it could and should be. Many studies have demonstrated the uneven quality of care provided by US clinicians. The consumer experience can be maddening, with piles of meaningless paperwork, endless bureaucracy, duplicative tests, poor communication and fragmentation among physicians, and generally lousy service. The technology revolution, which has swept through and upended most service industries, has barely made a dent in the manner by which medical services are provided to patients, which looks today pretty much as it did a few decades ago. In a functioning marketplace, the suppliers of products and services strive to innovate and provide high-quality services to their customers because that is the way to stimulate demand and achieve higher profits. A company only does well if it is able to convince a sizeable number of consumers that what it is offering is worth whatever amount the consumer must pay to get it. But the health sector is different from the rest of the US economy because the consumption side of the marketplace is dominated by third-party insurance payments. Consumers pay very little directly to the suppliers of medical services. Instead, third-party insurance pays the vast majority of the medical bills on patients’ behalf. This is by design. In 2012, there were about 242 million Americans under the age of 65 who were enrolled in health insurance, and 92 percent of them were in plans subsidized by the federal government. There were 156 million people enrolled in employer-sponsored insurance plans. Employer-paid premiums are excluded from workers’ taxable compensation for purposes of both the income and payroll tax. Over time, this tax break has encouraged employers to substitute expansive health insurance coverage for higher wages. Beyond job-based coverage, another 66 million people were enrolled in Medicare, Medicaid, or the military health insurance system. In each of these insurance systems, the consumers pay very little at the point of the service. The diminished role of the consumer is evident in national statistics. 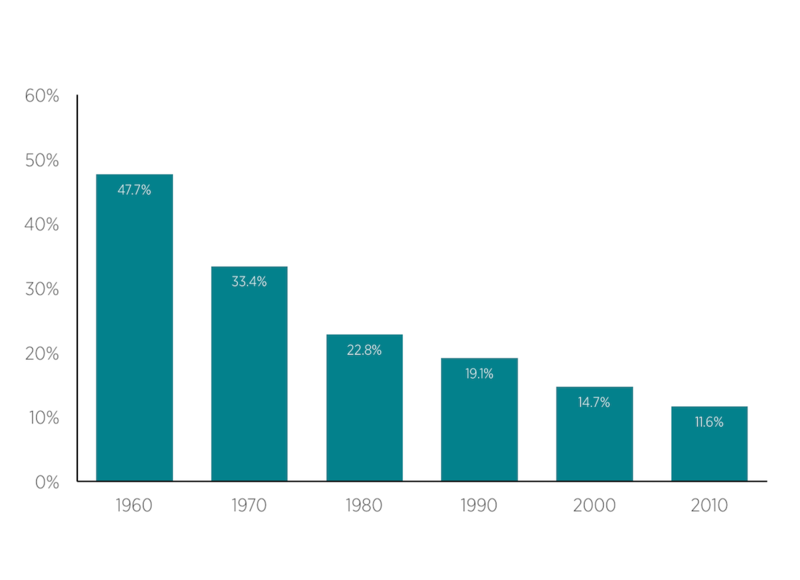 As shown in figure 1, in 1960, consumer out-of-pocket spending for medical care accounted for nearly 48 percent of all spending on health in United States. By 2000, the percentage of national health expenditures paid for directly out of the pockets of consumers was down to under 15 percent, and in 2010 it was just 11.6 percent. The displacement of the consumer has had consequences. The terms by which physicians deliver services to patients are now dictated much more by the fine points in their contracts with employers and insurance companies than by any quality commitments they make to their patients. Source: Centers for Medicare & Medicaid Services, “National Health Expenditures” (historical tables). Medicare plays a particularly dominant role in setting the terms under which the vast array of providers of medical services must operate. Since the program was enacted in 1965, the Medicare bureaucracy has erected a vast web of payment rules and regulatory requirements that permeate the entire health sector. Physicians, hospitals, nursing homes, hospices, outpatient clinics, labs, device manufacturers, and every other supplier of clinical services must contend with the methods by which Medicare approves and pays for services. Because so much medical care is directed toward the elderly and disabled, it is not possible for most practitioners to simply ignore Medicare’s rules and go their own way; the revenue Medicare provides is necessary to sustain most aspects of the medical services industry, and therefore the government has substantial leverage to dictate the terms under which it makes payments. Moreover, Medicare’s influence extends well beyond just those supplying services to the program’s enrollees. Private insurers piggyback on Medicare’s payment framework to compensate physicians and hospitals. According to a 2006 American Medical Association survey, some 75 percent of private insurance companies used the Medicare physician fee schedule as the basis for paying doctors in at least one of their product lines. Similarly, the vast majority of private insurers use Medicare’s diagnosis-related group payment structure to make payments to hospitals for inpatient services. The extensive use of Medicare’s regulations for paying for medical services and products is a major impediment to innovation and customer-focused service delivery in the health sector. Physicians and other entrepreneurs who seek to provide new and better methods of taking care of patients, perhaps using information technology, are immediately faced with the question of whether or not Medicare will pay for what they are planning to offer. Bringing a new approach to the marketplace is therefore less about selling the idea to consumers and more a matter of of convincing the Medicare bureaucracy that what is being proposed is worthy of reimbursement. Unfortunately, it is always easier and less risky for the bureaucracy to delay changes rather than approve them. Thus, there is a strong, inherent bias in US health care in favor of incumbents and their way of doing business and against new entrants and innovation in patient care. Information technology and medical discovery have the power to transform medical care in the United States for the better. Consumers want convenient, personalized medical attention that is forward-looking and proactive based on their medical profiles and not simply reactive when problems occur. They also want to track their medical records more carefully so that they can take more responsibility for improving their overall health. All of this is possible, but it will require adjustments to current arrangements to allow consumers and suppliers of medical services to come together to pursue new ways of providing services. Suppliers of medical care need the freedom to develop entirely new ways of taking care of patients. Providing the space for new innovations to develop will require a concerted effort across federal and state regulatory agencies. The federal bureaucracy regulating the Medicare program must become open to allowing innovative care delivery arrangements. One way to do that would be to set up an expedited approval process for innovative services, along with a separate cost-sharing structure for the beneficiaries. Under this structure, physicians and others could come forward with new ways of taking care of their patients and then receive approval for their approaches if they are able to get consumers to pay for part of the bill. Medicare should calculate what it would pay if the services were provided in a more traditional manner; any expense above that should be covered by the Medicare enrollee. State licensing boards should allow accountable organizations to take responsibility for assigning clinical tasks across practitioners rather than trying to micromanage those decisions with arbitrary state rules. This change would allow organizations such as retailers and national pharmacies to be more aggressive in using convenient care models, supervised by physicians, to take care of patients through technology and nontraditional care sites. Moving more care to less expensive, nonmedical settings has the potential to generate substantial cost reductions. Innovation among suppliers of medical care will accelerate when they are able to deal directly with more consumers rather than insurers and the government. The key to empowering consumers is more widespread use of health savings accounts (HSAs). HSAs provide financial protection for enrollees even as they encourage consumers to aggressively seek out high-value, low-cost care when spending their own resources. The accounts are owned by the enrollees, so they have a strong incentive to use their resources only on services that they find truly valuable. The number of Americans enrolled in these arrangements has increased rapidly in recent years, from 3.2 million in January 2006 to 17.4 million in January 2014. But still more enrollment in these plans will be needed to provide enough of a consumer-driven marketplace to drive innovation and adaptation by clinicians and suppliers of medical care. That can be accomplished with reforms to a number of existing policies. Create a universal HSA allowance. Currently, only persons with high-deductible health plans can contribute to an HSA each year. There is no reason why persons with lower deductibles also should not be allowed to make a contribution each year to prepare for the future and to give themselves more protection and flexibility. Giving all Americans the ability to contribute $2,000 per year would go a long way toward increasing take-up and use of HSAs. Integrate HSAs into public insurance. With a few exceptions, HSAs are not a major feature of the Medicare and Medicaid programs. That should change. Participants in those programs should be allowed to take their entitlement to coverage in the form of a high-deductible insurance plan and a deposit of leftover funds in their HSAs. This would ensure HSAs could be used throughout a person’s life, and not just during years when they are employed. HSA withdrawals are presumed to take place within a fee-for-service context. Withdrawals are only allowed to reimburse the account holder for paying directly for qualified medical services or products. This requirement hinders the development of alternative payment approaches that would work better for the enrollees and for the integrated delivery plans and other direct-pay physician relationships that require payment methods other than FFS. For instance, HSA enrollees should be allowed to use their funds to purchase a predetermined level of access to care from an integrated health plan, or from a specific physician or other provider, for a monthly fee. An HSA enrollee could make payments directly to his or her primary care physician under a direct-pay arrangement, independent of insurance or any network requirement. The fee could cover a certain number of physician visits, phone consultations, online health support, and other services to help enrollees meet their routine health and wellness management needs. Advances in information technology and knowledge of human health have the potential to revolutionize the way medical care is delivered to patients over the coming decade. Americans could get better health care, at less cost, if those delivering services to patients have the freedom to take full advantage of what these advances make possible. For that to happen, however, US health care will need to move steadily away from the bureaucratic model of resource allocation. Consumers must be given the power to steer a much larger slice of the healthcare pie, and suppliers of services must be given the freedom to meet consumer demand with products that improve the convenience, efficiency, and effectiveness of medical care in maintaining and improving the ability of patients to live fully functioning lives. James C. Capretta is a senior fellow at the Ethics and Public Policy Center and a visiting fellow at the American Enterprise Institute. He studies and provides commentary on a wide range of public policy and economic issues, with a focus on health care and entitlement reform, US fiscal policy, and global population aging.